Thumpermonkey might be taking a more subdued approach to their music, but it’s no less rife with intricacies and powerful moments. ‘A person in space, walking, or adrift, but safe, exploring, freedom, discovery‘. These are the words that open up a short band profile on Thumpermonkey‘s Bandcamp page. It’s a succinct way to describe what they achieve with Make Me Young, etc. The London quartet evoke feelings of isolation, discovery, warmth, euphoria, suspense, and more with their progressive rock approach. Really, it’s almost like a Broadway play on the stage of space, complete with a short intermission (“Buttersun”). 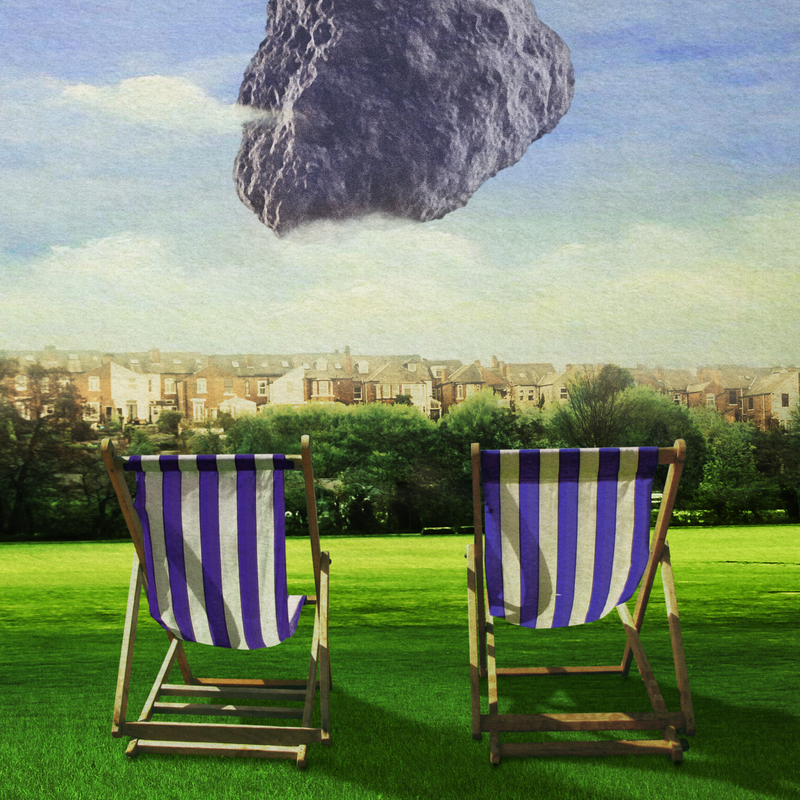 The cover art speaks a thousand words; two lawn chairs provide a front row viewing of the end of the world, caused by a meteor kissing the earth presumably at a very, very high speed. It’s basically the British prog version of Majora’s Mask, but maybe that’s too reductive. Make Me Young, etc takes a ruminating look at the circumstances at hand, asking ‘…What do you do, when you survive the building falling?/And what happens next, when you’ve been groomed hard for destruction?‘ in the title track. Later on, a repeated mantra for when the meteor hits: ‘Take this useless sadness and throw it away‘. Where the whole space thing comes into play isn’t just the presumed origin of the meteor that will cause us all an untimely end, but also the sound and tone of Thumpermonkey‘s apocalyptic opus. It’s decidedly calm, even serene at times, with moments of directed energy that unequivocally put the ‘rock’ in ‘prog rock’. It’s like being wrapped up in the entropy of space, where anything can conceivably be encountered, for better or worse. Just listen to “Figstorm”, which takes a left turn in its final couple minutes to build a suspense completely unforeseen throughout the rest of the song. The approach to an extinction level event such as this is handled almost with whimsy at times. Moments of blunt aloofness show themselves in the lyrics (‘Time is up, hope you had a whole bunch of fun while you could‘), but each song’s instrumentation is the comforting hand on your face – shimmering piano lines, quiet and organic drums, and guitars that feel weighty without alienating or disturbing. One of my favorite moments on this album is “Cranefly”. The song begins with a bass-centric groove that builds into different measurements of varying catchiness, each instrument taking lead at different times as if mimicking different voices of the story along with the vocals. It’s an ebb-and-flow of celestial painting by vocals and keys, with guitars and drums driving the song forward throughout that same landscape. You can tell the quartet are intent on building a world here. Throughout the album’s release cycle, they’ve released short vignettes on Facebook counting down the days to impact (release date). In them, a man narrates events and thoughts with eerie cryptics, all leading to the end. They’re foreboding, using surreal and abstract visuals that thematically match with some of the visuals portrayed by the lyrics of the album. Everything seems to connect. What’s more, it also seems to be partially influenced by an odd e-mail that singer Michael Woodman received years ago from a fan about the end of the world. More details on that on their Bandcamp page. Across seven songs, Thumpermonkey weave a tale that’s been told many times before, but with a delicate prog rock execution that’s rarely seen. Boiled down, it’s just a real nice listen to begin with, easy to loop over and over, good for nearly any occasion. This ain’t Sleep Furiously, but it succeeds because of that. With the limited time you have left on earth, Make Me Young, etc is worth devoting your attention to. Don’t make no (other) plans for October 26. Previous PostA Forest of Stars - "Grave Mounds and Grave Mistakes"
Next PostGraf Orlock Announce New Album, "Examination of Violent Cinema, Volume 1"